As summer draws to a close, my husband Matt and I, like many LGBTQ parents, are both excited and anxious for the new school year to begin. As our daughter enters middle school in a new school building with new staff and administrators, saying that my family is “anxious” is an understatement. As parents, we have a responsibility to make sure our daughter feels respected and welcomed at her school to achieve her fullest potential. Here are some tips from my LGBTQ-headed family to yours for a smooth back to school process. I always "come out" and stay visible with the staff, administrators and the school community. We speak about our family structure as a matter of fact. For me, it is important to demonstrate to my daughter that I am proud of our family and that we are no different than any other. I want my daughter to be able to talk about her dads without hesitation. My family lives in a fairly progressive, inclusive community which makes it safe for us to be out. Of course, for some families, coming out as LGBTQ may not be possible after considering safety concerns for the whole family. Be conscious of the fact that children with LGBTQ families will have to come out as well, and it is important to talk with your child about this process for them. In speaking with teachers and staff, it is very important to emphasize to them that they should never “out” a child as being part of an LGBTQ family. This decision rests solely with the child when they are ready. Since my daughter entered kindergarten, my husband and I have prioritized researching her school and district. We want to see if bullying, harassment and non-discrimination policies include sexual orientation and gender identity, if the the school celebrates the racial and economic diversity of students and staff, and if the school is a local leader in creating safe and inclusive learning environments. Collectively, these pieces of information can indicate how welcoming the school community is. In speaking with school community members, I discuss the language we use to talk about our family and answer any lingering questions school staff may have. It is important to me to connect with every adult my child may meet in the school, from the music teacher to the recess aides, so I ask my child’s teacher to make sure all school staff are inclusive of our family too. By providing school staff with my family’s context and the language that we use, we can work in tandem with staff to interrupt anti-LGBTQ bulllying to benefit not just my family but the whole school community. I am an active member of my daughter's school's Parent Teacher Association (PTA)/Parent Teacher Student Association (PTSA) and strongly encourage other diverse families that are able to do the same. The PTA should be aware of protections, policies, and realities for LGBTQ students and staff. If the school or district lacks LGBTQ protections and policies, the PTA is an avenue to advocate for them to be implemented. The National PTA adopted a resolution regarding LGBTQ individuals as a protected class and provides strategies for inclusion of LGBTQ children and families. Encourage your school, or even your entire school district, to implement professional development to improve the school climate for all students. Professional development will foster a safe and welcoming school for your child and every child who attends the school in the future. 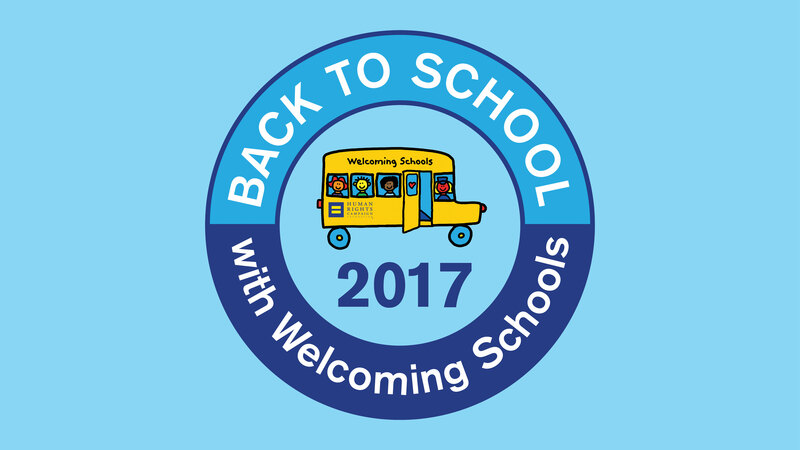 Consider bringing Welcoming Schools workshops, on topics from preventing bullying to supporting transgender students, to staff as part of their professional development. Ultimately, the most important thing is for your child to start the year off excited and ready to learn. Like you, I just want my daughter to able to thrive in the classroom and in life — and to do this she needs to feel safe, comfortable and welcomed at school every day. Housed by the HRC Foundation, Welcoming Schools and Time to THRIVE are national programs to help LGBTQ youth succeed. Welcoming Schools provides professional development to educators and free resources to educators and families to support a respectful elementary school climate for all students. Time to THRIVE is an annual national conference that brings together K-12 educators, counselors and other youth-serving professionals to build awareness and cultural competency to better support LGBTQ youth.